Tip Top is New Zealand's leading ice cream company and produces around 50 million litres of ice cream per year out of facilities in Auckland and Christchurch. For their popular 2L ice cream tubs TipTop use state-of-the-art packaging design, with colourful graphics - all designed to make the product look as good as it tastes. A recent decision to remove the barcode from the lid of the container introduced a challenging food safety concern: How do you guarantee the correct packaging is being used for the ice cream currently in production? A packaging mix-up, if gone undetected, could lead to a costly product re-call. And, with food allergies, a potentially serious food-safety situation. ControlVision supplied a solution to both Auckland and Christchuch based on Cognex In-Sight vision sensors with PatMax pattern matching. Pattern matching on unique features in artwork provides a fail-safe method of verifying the correct packaging for the appropriate product. PatMax is tolerant of variations in product presentation angles, and can even cope with perspective distortion. The top and side of the container are searched for a taught unique feature, e.g. the product name graphic. If a positive match can't be found, then the container is automatically rejected at a down stream reject station. New products are quickly set-up with a wizard that takes maintenance staff through the steps required to teach a new pattern template. 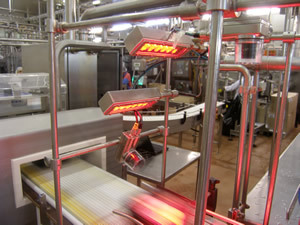 Operators select the product at the beginning of a production run using a simple software interface provided by ControlVision's Recipe Manager software.